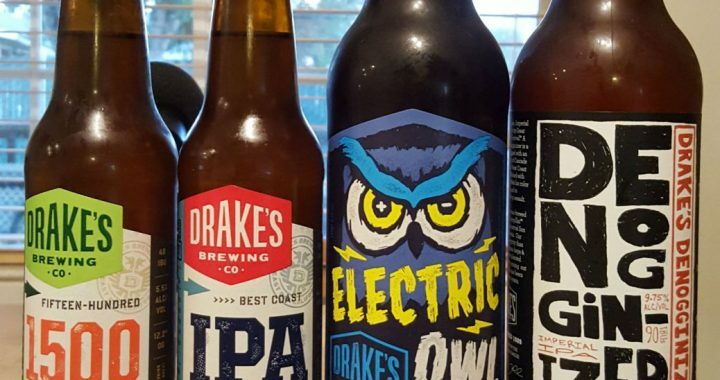 Our guest today on Brew Ha Ha is John Gillouly head brewer at Drake’s Brewery in San Leandro. Steve Jaxon, Mark Carpenter and Herlinda Heras will taste and talk about some of the very interesting brews that they serve there. First they taste a New England style IPA, which is hazy or cloudy. John says that the west coast brewers have taken over the New England style. He thinks a New England style with the heavy mouth feel (not dry like a San Diego style IPA) but with some bitterness and dryness, for balance. Steve points out it’s 8.4% alcohol. Mark Carpenter introduces John Gillouly. 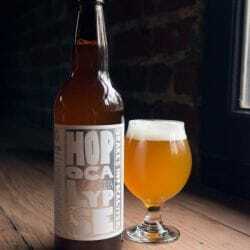 Hopocalypse is a high alcohol highly hopped beer. John says some New England brewers use trick ingredients to get hazy beer. The haze in this beer is from raw wheat, which has proteins in it that make the beer hazy, like a Hefeweissen. The level of hops is driving a polyphenol haze. Steve stops for a geek alert. Once you get your dry hop rate high enough, it just won’t clear out. Mark says Hopocalypse has a nice balance, not the San Diego style that is so hop forward that that’s all you get. Then Mark opens another IPA, Hopweiss. Drake’s is in San Leandro, near Oakland. John Martin, one of Drake’s owners, also owns Triple Rock, the oldest continually owned brewpub in America. It opened in Berkley in 1985 and a former Triple Rock brewer who worked for John Martin opened Drake’s in 1989. He started Drake’s to make English style beers in the 1980s. In the early 2000s he sold it to another company but three years later John Martin bought it. Mark remembers in the ‘80s it was the early days of the local brewing industry. For a while, some friends of his had access to lots of crawfish, which they were exporting to Europe. Next week Herlinda will be at the World Beer Cup craft brewer’s conference in Nashville next week. 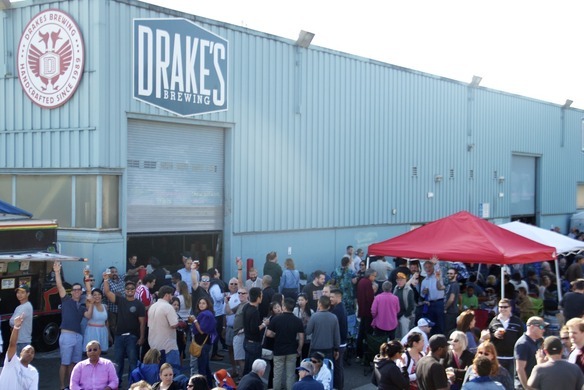 The crowd of happy patrons outside of Drake’s Brewing in San Leandro.